Beating Bulls & Hawks, Wolves Reshape Hopes…Expectations? On Saturday the Timberwolves won in overtime at Chicago. They beat a Bulls team that won 50 games last season, and had just beaten the Oklahoma City Thunder the night before, in the primetime TNT game. Andrew Wiggins had 31 points. Rookie Karl-Anthony Towns had 17 points, 13 rebounds, and 4 blocks. This came as a surprise, as the Wolves had just lost a one-sided affair on their home court to the Miami Heat and did not show signs of being able to compete with the likes of the Bulls, especially on the road. Tonight, the Timberwolves won at Atlanta. The Hawks won SIXTY games last season, and came into tonight’s contest with a 7-1 record; the best in the East. This morning in his weekly power rankings, Marc Stein of ESPN listed them third in the NBA. This time Wiggins had 33 points, 5 rebounds and 4 assists. He dominated crunchtime on offense. Karl-Anthony Towns again had 17 points, this time with 12 rebounds and 3 blocks. He dominated crunchtime on defense. Just four nights after that expectations-lowering egg they laid on Target Center floor against the Heat, the Timberwolves have fans excited again. Not about the future, we’re pumped about the future no matter what. Eventually, a team with this much talent will be good. But fans are going to be excited about the present – the basketball being played right now – if this Wolves team can go on the road and win at Chicago and Atlanta in back-to-back games. They’ll be doubly excited if these wins are coming on the backs of Wiggins and Towns (and Rubio, whose overall play continues to lead the team) instead of the older vets like Prince, Martin and Garnett. The vets are helping, don’t get me wrong, but the heavy lifting is being done by the Timberwolves that figure to be here for many more years. This game tonight in Atlanta was a crazy one, as everybody who watched it knows. The Wolves played FLAWLESS basketball in the first half and led by a whopping 30 points at the break. Seriously, it’s hard to emphasize enough how perfectly the Wolves were playing on both ends of the floor. Along with the usual defense and passing from Rubio, scoring from Wiggins, and the interior presence of Towns, the Wolves were getting unexpected contributions all over the place; nowhere more significant or unexpected than Zach LaVine who might’ve played better than any of his teammates through halftime. While some type of Hawks comeback was plenty foreseeable, I think most would’ve expected Atlanta to show some veteran pride, cut the Wolves lead down to 15 or even 10, before running out of gas before the game got too close. Comments Off on Beating Bulls & Hawks, Wolves Reshape Hopes…Expectations? In which we discuss Karl-Anthony Towns, Ricky Rubio, and early impressions on the 2015-16 Wolves season. –Jim Petersen, on Karl-Anthony Towns, during the 3rd Quarter of last night’s telecast. Is Karl-Anthony Towns the real deal? He was the player they selected with the first overall draft pick, for the first time ever. With a semblance of a young Timberwolves nucleus forming, Towns figures to be in the middle of it, next to Andrew Wiggins. If the Wolves are going to succeed in their Thunder Model rebuild, Towns needs to be an all-around force; the kind of player that can put a team on his back and carry them to some wins. For the first time in his two-games-long career, we saw evidence of this last night in Denver. The stats tell most of the story: KAT had 28 points, 14 rebounds, 2 assists, and 4 blocks in 33 minutes of +15 basketball. His team won easily (in a game that Vegas pegged them as underdogs) and he was by far the biggest reason why. Towns looked comfortable shooting or driving, as the situation required. When an interior defender was out of position, Towns initiated the precise amount of contact to both draw the foul and maintain balance to finish the play and make the shot. His awareness might have been highlighted best by a play that didn’t register a stat: in the post, he head-faked, drew extra defenders, pivoted out of the defense and kicked out a perfect pass to Ricky Rubio at the top of the key. Ricky’s shot rimmed out — so no assist for Towns — but it was a helluva play; one that demonstrated poise and awareness befitting a player way older than 19. On defense, Towns was very good. He had those 4 blocks and 14 rebounds (11 of them defensive) and goes after defensive boards with the same type of urgency that Kevin Garnett and Kevin Love do. When Towns senses an opponent’s hand creeping in to poke the rebounded ball away, he promptly flares out his elbows and looks for Ricky Rubio to push the ball. This was just one game, but it seemed almost unbelievable that a 19-year old rookie could look so good in his second professional game. Fans should be excited about this player. 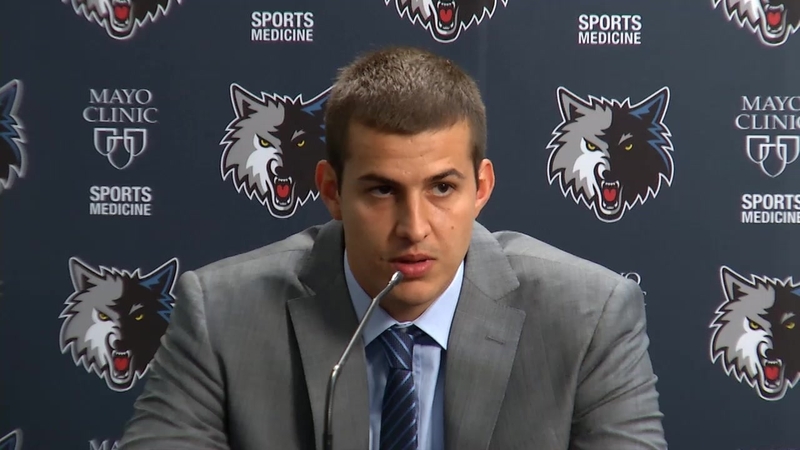 INBOX: Can Bjelica and Rubio Save the Wolves Offense? Andy G: The Wolves have played 4 preseason games. They have won 1 game (Wednesday night versus the Raptors in a game where both Kyle Lowry and Luis Scola sat out) and lost three; the first two in blowout fashion to the Thunder and Bulls and then a closer loss to the Raptors in their first leg of the Canadian double-header the two teams put on, in Winnipeg and Ottawa, respectively. Nemanja Bjelica, and how his style of play might positively influence the (outdated) style of offense that both Flip Saunders and now Sam Mitchell seem to prefer when putting together their default sets. Allow me to briefly explain what I mean. In these preseason games (and in the intrasquad scrimmage that was played at Target Center a short while back) the Wolves have been running an offense that has looked largely similar to what Flip ran last year. It involves down screens (“pin-down screens” in modern NBA lingo) set by bigs for wings, who either look for their own moving mid-range jumper, or catch the wing entry pass and then look to feed the post. That’s the default setting. A lot of specific set plays are blended in — often times when Kevin Martin checks into the game, or if Andrew Wiggins has not been sufficiently involved in the offense — that are completely engineered to free up a wing player for either a quick jumper, or an isolation set of his own. These plays usually involve a few seconds of dribbling the air out of the ball on the wing while an assortment of big Timberwolves clump together near the paint to set a double or triple screen for the chosen teammate to be freed up for an isolation set. Almost none of this action is good. (I think a limited exception involves Shabazz Muhammad posting up certain opponents.) It wastes precious shot-clock time and is purposefully engineered to create inefficient shots. The goal — a chance to shoot a defended two-point shot — does not make sense, in today’s NBA. There was a time when these were the premier play designs for legends like Michael Jordan, Charles Barkley, and Patrick Ewing. That type has passed. When Bjelica checks into the game he tends to get the team playing smarter offense. As a 6’10” forward who can shoot from 27 feet out with ease, he stretches the opposing defenses out, and thus creates more room for his teammates to operate in space. Along with the simple “he’s a threat to shoot from way outside” factor, Bjelica is also a facilitator of screen-and-roll sets both as a screen setter, and also as a dribbler who will call for ball screens to come his way, too. Are you seeing what I’m seeing? Does the offense look better with Bjelica out there, and does it seem to be in large part because of how he plays and influences their approach? Should we expect a better look from the starting squad when Ricky Rubio returns? He hasn’t played yet, and — thus far — the Wolves starters are the worst-looking group they have. 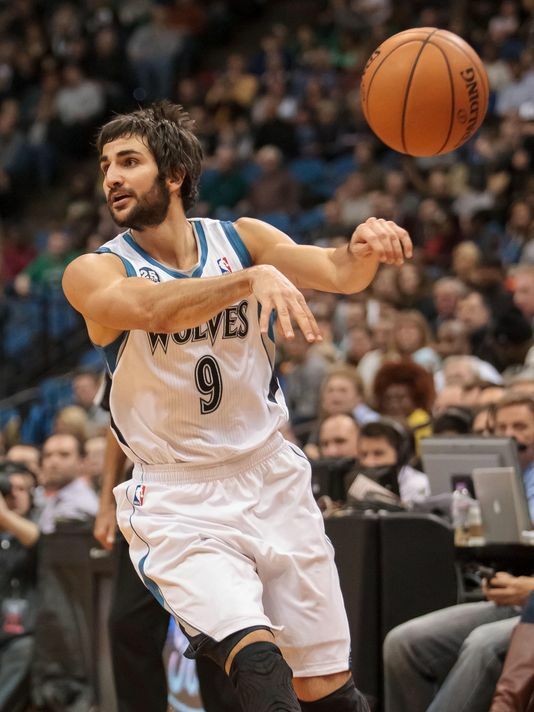 Ricky Rubio is the best point guard in the NBA. Steph Curry is the best point guard in the NBA, and there are at least a handful of others (Chris Paul, John Wall, Damian Lillard, Mike Conley) who are certainly better players than Rubio. On this team, Ricky Rubio is a part of the solution; not part of the problem. (It will be interesting to see how patient Mitchell is with point guard Ricky Rubio. The Wolves want Rubio to relax at long last, to understand he’s no longer thought of as the franchise’s savior — or not even one of the team’s top three talents. It seems like Aldridge and too many others believe Rubio might not be good enough for this Wolves team, going forward. The last time we posted, it was June 29, and Andy G mused about the Wolves’ 2015 draft, in which they selected the much-haralded Karl-Anthony Towns #1 overall and pulled off a trade to get back into the first round to draft Apple Valley native and Duke Final Four hero Tyus Jones at number 24. Much of the reaction to the draft fell into a few different bins. One bin could be called “Yay, we took Karl-Anthony Towns #1!” This encompassed most of Wolves fandom, at least that segment of which is most active on Twitter and websites like Canis Hoopus. Towns was the consensus top player overall and Wolves brass finally made the obvious correct choice: they got the player that analysts and smart fans expect to be the best player from this draft. Towns fills a position of need for the Timberwolves. Nikola Pekovic, the brutish but oft-injured Montenegrin who is under contract with the Wolves through the 2017–18 season, has foot injuries that may end up threatening his career. He can’t be counted on as an integral anchor for the Wolves at center as the rest of the team blossoms under the leadership of rising stars like Andrew Wiggins and Ricky Rubio, not to mention intriguing prospects like Shabazz Muhammad and Zach LaVine. Kevin Garnett is also back in the fold, on a two-year, $16 million deal. But Garnett cannot be fully counted-on either, for he is too old and too often injured. His return appears more as foreshadowing his move into ownership and management with Flip Saunders and Glen Taylor than it does a productive output on the floor this season or next. The bottom-line is, the Wolves had a need at Center. As a marvelously skilled big man, Towns should eliminate that need altogether. A second bin of Wolves draft-related conversation could be called “We took Tyus Jones! He’s from Minnesota!” I’ll talk a bit about Jones first, and then discuss my reactions to Karl Towns. For the Wolves, Wednesday’s finale didn’t feel significant at all. It was a continuation of most of ‘Sota’s season, really. The Wolves were out of the playoff race almost as soon as it began, and — through a series of roster management decisions — signaled many times over that they were much less interested in fielding a competitive night-to-night lineup than they were in securing a high 2015 draft pick under the guise of squeezing every ounce of potential out of rookie Andrew Wiggins. We thought it made enough sense to kickstart the recap process and look at some things we learned about this Wolves team, this season. Part I will focus on the guards. Part II, which will come over the weekend, will look at the wings. In this entry, we don’t dwell on Mo Williams or Lorenzo Brown. You already know why. Read below the fold for more on Ricky Rubio, Kevin Martin, and Zach LaVine.